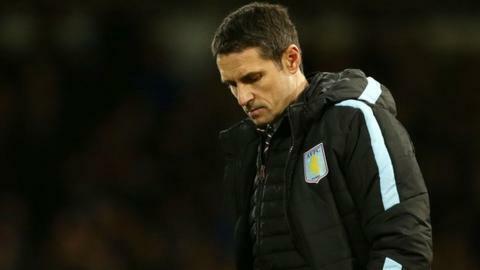 Aston Villa manager Remi Garde refused to talk about his future following his side's 2-0 defeat at West Ham. The Midlands club are bottom of the Premier League - 10 points from safety - and failed to make any signings in the January transfer window. Reports have since suggested Garde will reassess his future in the summer. But the Frenchman said: "I'm speaking only about the game. I have nothing else to say. It's not the time to answer this question." Villa had a penalty appeal rejected against the Hammers before having Jordan Ayew sent off after just 17 minutes. West Ham opened the scoring through Michail Antonio - a goal Garde thought might have been offside - before Cheikhou Kouyate added a second for the Upton Park outfit. "I'm not going to speak any more (about) the incident, it's a major one in the game but I don't have to explain my feelings, and you can guess Jordan's feelings," he added. "Whatever happens in the dressing room is private. "But I'm not sure it was the only incident that turned the game. Of course I think we should have had a penalty. "I'm not a lucky or unlucky man, but I don't like to hear it's because we are at the bottom. The rules in football are there for everybody."